January 23, 2018 4 comments on "Removing Rotten Meat Smell or Odor from the Freezer"
Tip #1: I clean a fridge or freezer that has rotten smells with either bleach or baking soda or vinegar, but also I remove the drip pan at the bottom of fridge/freezer either in the back or front at bottom as if the blood from the meat dripped down into it the smell will stay and only get worse. I cleaned out a fridge that had raw meat that got rotten in it and still it smelled bad till I pulled the drip pan out and cleaned it out really well. I keep an open box of baking soda in both the fridge and freezer at all times. 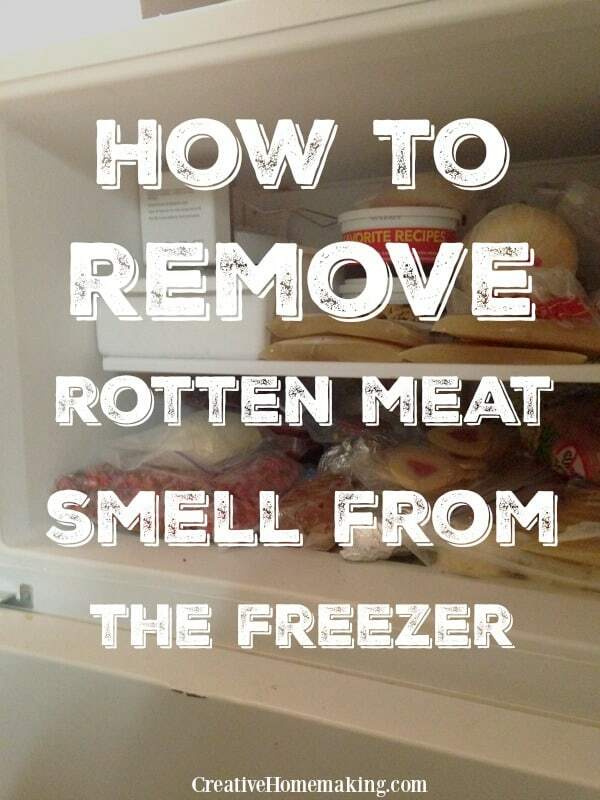 Tip #2: Try placing a container of vinegar in the freezer. Leave the container open. Tip #3: Put a large bowl or pan of kitty litter in the freezer and then close it for a week. Be sure to use the kind that contains chlorophyll…the green stuff…not the clay type! This worked wonders for us! Tip #4: Try a freshly opened can of coffee. This is what they use in the trucks that they haul animal hides in. 4 Comments on "Removing Rotten Meat Smell or Odor from the Freezer"
I earlier did say that using coffee did work. It only seemed to work briefly for my deep freezer. By the way, the freezer was switched on. Later when I went to it it was still smelling very badly!!! Apologies for miss-leading any one. Sorry about your situation. Hope you haven’t thrown away your units yet!! 1. If you have the manual for the units, please read them. They should tell you if there are drip pans in the units. If you don’t have the manuals, see if you can get them from Google. 2. Mega thanks to the suggester of Tip.#4 on this website. Please try the coffee granules as suggested on this web page. They worked so shockingly fast (5 to 10 mins) to clear the same odour in my deep freezer!!! All I put into the freezer was about half a little bowl (that you might use to serve a visitor some nuts) of coffee. You might prefer to pour the coffee on a sheet of paper or cardboard just in case you can’t slide a can / saucer under the units. Put some also in different parts of your garage. 3. If you must move the Units, kindly please approach your neighbours or the Pastor of your nearest church or Charitable Organisation and ask nicely for some help to move them. They will respond. Hope you have been helped!!! We were out of state for approximately 6 wks. The GFI that our fridge and separate freeze was connect to tripped and the food rotted. I have thoroughly cleaned both with hot soapy water with bleach however, they smell still lingers outside the units. I have used several cleaners on the floor underneath but have yet to get the smell out. I called a professional cleaning service and they said that if liquid from the food got into the insulation we would have to get rid of the units. They could not tell me how to tell if that happened. We have not been able to determine if there is a drip pan in each one (we are elderly). Any suggestions as to what we do at this time? Any help you can provide will be greatly appreciated. Both units are in the garage and the furnace is pumping that smell into the entire house. Previous Previous post: Does the Listerine Foot Soak Really Work?